Mental Health First Aid (MHFA) is an interactive 8-hour training course that presents an overview of mental illnesses and substance use disorders in the U.S. The course introduces participants to risk factors and warning signs of mental health problems, builds understanding of their impact, and reviews common treatments. Similar to traditional First Aid and CPR, MHFA is help provided to a person developing a mental health problem or experiencing a crisis until professional treatment is obtained or the crisis resolves. MHFA is an evidence-based public education and prevention tool which improves knowledge of mental health and substance use problems and connects people with care for their mental health or substance use problems. During each instructive period, attendees can expect to participate in educational and engaging activities to learn about mental health problems. The course offers a five-point action plan and easy to follow materials for non-clinicians to identify, understand, and provide initial help to individuals in crisis or showing symptoms of a mental illness or substance use disorder. The course, developed by the National Council for Behavioral Health, provides a sensitive atmosphere, where participants can feel comfortable to discuss personal and hypothetical situations related to mental health. 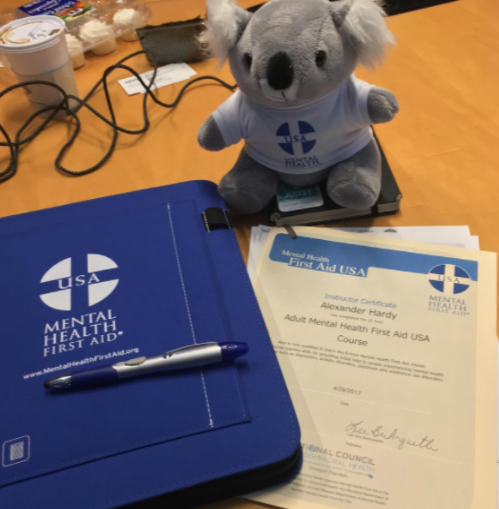 WHO IS MENTAL HEALTH FIRST AID TRAINING FOR? The Mental Health First Aid course can be offered via one eight-hour training session or two four-hour sessions. The MHFA training introduces participants to risk factors and warning signs of mental health problems, builds understanding of their impact, and overviews common impact, and treatments in relation to adult mental health. Certified aiders will be able to learns an action plan to help when an adult is experiencing a mental health crisis or when an individual is in the early stages of a mental health disorder. 1 full-color MHFA training manual (retailing at ~$20) per participant, worksheets, all necessary teaching materials. Access to ongoing support and helpful resources and content via the GetSomeJoy network and wellness hub. And here is a one-page overview (PDF) of the Mental Health First Aid training. New York City-based food-lover Alexander Hardy is a writer, mental health advocate, dancer, teacher, lupus survivor, and co-host of The Extraordinary Negroes podcast. He has written for Ebony Magazine, CNN.com, Esquire, Gawker, Courvoisier, The Huffington Post, VICE, Saint Heron, and Very Smart Brothas, and is a nationally certified Mental Health First Aid instructor. Alexander is a board member of the Center for LGBTQ Studies (CLAGS) at the CUNY Graduate Center and Founder and Creative Director of GetSomeJoy, a multimedia campaign and event series promoting mental and emotional wellness among Black and brown folks. Alexander does not believe in snow or Delaware. inquire about a mental health first aid training. Alexander is located in New York, NY, but is available to travel.